Panasonic has introduced a new 24x superzoom camera with full HD video recording. Slotting into the top of its superzoom compact digital range, the camera boasts a 25mm wide angle, 24x optical zoom Leica DC VARIO-ELMARIT lens. Also equipped with Panasonic's Black Box Nano Surface Coating technology to minimise light reflection that can cause ghosting and flaring, the camera is also capable of shooting full HD videos. The lens comprises 14 elements in 10 groups to include 3 ED lenses and 2 aspherical lenses with 3 aspherical surfaces. Designed for the best optical performance, Panasonic promises that it suppresses distortion at the wide end and colour bleeding at the tele-end. Zoom power can be increased from the standard 24x optical zoom to a 32x equivalent using the Intelligent Zoom function. Intelligent Resolution technology means that picture quality is theoretically maintained even when using a digital zoom. Equipped with a 12.1 megapixel MOS sensor and a Venus Engine, the camera promises high performance in both sensitivity and speed. A newly developed Multi-process Noise Reduction works by applying noise reduction according to the brightness in the picture. As well as HD video recording, fast shooting at 12fps (without autofocusing) is also possible, or 5.5fps (with autofocusing), both at full resolution. Full manual control is available on the DMC FZ150, with a side level on the left side of the lens barrel allowing for smooth zooming. Focus can also be changed with the lever, which could prove handy while in video recording. Creative Control is a new feature, which includes a number of artistic effect modes including expressive, retro and sepia, as well as Photo Style. Creative Video mode is also available, which allows users to set shutter speed and aperture manually. A hotshoe allows various accessories including an optional stereo microphone or external flash can be found at the top of the camera. 3D shooting is available by taking 20 panning shots and the camera automatically selecting the two most suitable images. The resulting 3D image can be viewed on a compatible 3D device. A number of shooting modes are included on the camera, including Intelligent Auto, Motion Deblur and Intelligent Handheld Nightshot. Face Recognition function is able to remember registered faces to give an appopriate autofocus on people, while removing red-eye. Intelligent Scene Selector chooses from 6 different scene modes for the best settings. 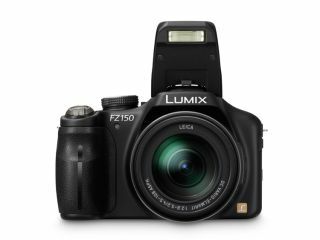 The Panasonic DMC-FZ150 UK release date is set for October, with UK pricing yet to be confirmed.